NEVILLE TWP., Pa. — After a big comeback against the top team in the state, a shorthanded goal sunk North Allegheny’s chances in a 4-3 loss to La Salle College High School in the 2019 Class-AAA Pennsylvania Cup at RMU Island Sports Center on Saturday. With the game tied in the third period, North Allegheny earned a power play, when La Salle’s Daniel Sambuco was called for cross-checking at 6:22 of the final period. But some careless play by the Tigers power play left the puck unattended behind the North Allegheny net. That’s where Explorers forward Sam Lipkin picked it up, turned to his backhand and beat North Allegheny goaltender Richard Karapandi to deflate the home crowd and lead La Salle to its sixth Pennsylvania Cup. Lipkin also opened the scoring and added an empty netter to earn a hat trick and seal the victory. Nicholas Sambuco scored a second empty net goal to give La Salle the final three-goal margin. Lipkin and Sambuco each finished with four points. Down two in the second period, the Tigers made a furious comeback, thanks to a dominant effort from the forecheck that allowed North Allegheny to keep the puck in the offensive zone shift after shift. That’s when Aaron Miller found the carom of a Haden Shimko shot that went of the end glass and batted it out of mid-air and into the net at 13:10 of the second. Two minutes later, Miller struck once again, finishing a 3-on-2 rush with Luke Turkovich and Tyler Lamark to even the game at 3-3. La Salle got off to a hot start, with Lipkin scoring just 20 seconds into the game. The line of Lipkin, Daniel Sambuco and Michael Casey did the heavy lifting early on for the Explorers. Sambuco assisted Lipkin’s early goal. Then after Tyler Putnam scored on a breakaway to tie the game at 1-1, Casey smashed home the rebound of a Sambuco shot 28 seconds later. Lipkin also assisted on that goal. Early in the third, it was the top unit for LaSalle striking once again as Casey got his second of the game from Sambuco at 3:24. The Explorers, which came into the game as the No. 1 team in the state, appeared to be in the driver’s seat. But that’s when North Allegheny changed the game thanks to a furious forecheck and the talents of Miller. 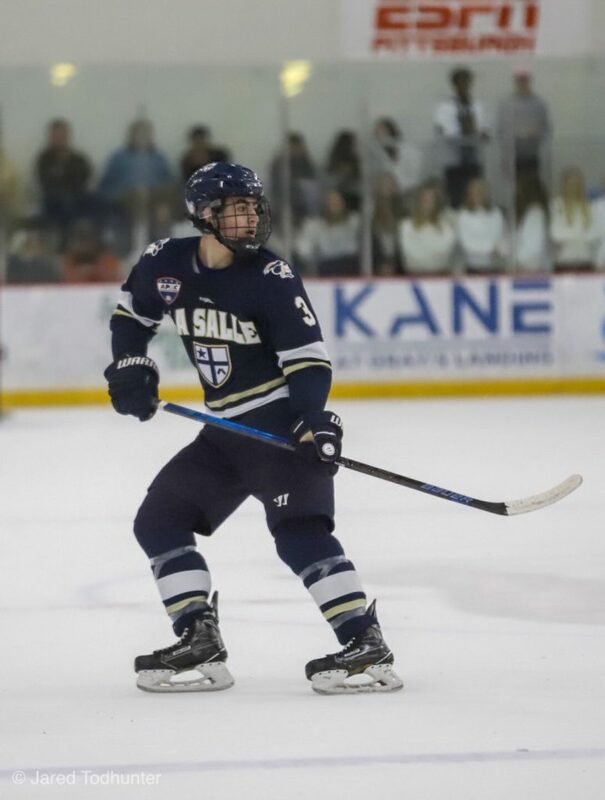 La Salle’s 2019 Penguins Cup adds to state titles the Explorers won in 2016, 2012, 2009, 2008 and 1998. The Flyers Cup winners won two of the three 2019 state title, with La Salle and West Chester Rustin representing the eastern side of the state and Pine-Richland representing the west. North Allegheny’s season comes to a close on a losing note, but was a successful one on the whole for the Tigers, which clinched its third Penguins Cup championship in 12 years.